If you’re a new parent or soon to be parent then getting a baby video monitor can be godsend. Baby monitors comprises of two parts, the transmitter and the receiver, they let you keep a close eye on your young one without having to be in the same room. While all parents will agree that these wonderful little tools are of great help they will no doubt be divided on which is the best. There is such a huge range to select from all with differing features that making the choice which one is right for you can often be confusing. We hope you can get some insights into the main features from this article; know what to look for and which pitfalls to avoid when buying a baby monitor that’s best for you. Regardless of whether you have an audio or audio and video monitor the set up is paramount. You should make sure that the transmitter is within range and can easily pick up the cries or a movement of your infant but isn’t so close to be a hazard to them. Make sure any power cords or leads can’t be reached from the crib so as your child isn’t at any risk of strangulation or of pulling the monitor onto themselves. For this reason they should be between one and three meters away from the baby’s crib which will allow them to pick up all those gurgles and sighs or cries for attention but not be so close as to be a hazard. There are some limitations of these baby video monitors and audio monitors as the wireless frequencies that many of these works on can be restricted by concrete walls and if you have a cordless phones or other similar equipment that could also interfere with the signal and reduce its strength and range. Also the signals from these devices are rarely encrypted so you could well find yourself picking up another family’s baby monitor and if you have a video monitor that’s not encrypted then the footage from this could also be picked up from another family’s receiver which is always worth keeping in mind. Range is important and all baby monitors and video monitors are usually tested rigorously to make sure that the range details listed are accurate. They are frequently measured in open spaces so if you live in a building with thick or concrete walls then keep in mind that will restrict the signal. Receiver size is worth thinking about. 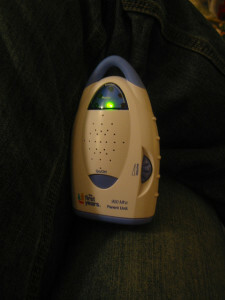 If you’re just sitting in one room then perhaps you won’t want to move the receiver around with you, however if you want to move around your house then having a small receiver makes it simple to move between rooms and take the receiver with you so you can keep track of your sleeping baby and know if they need you. Analog monitors are cheaper than the digital ones but you will experience a lower sound quality in these cheaper models. This is because the Analog signals are sent directly as radio waves where as digital models convert sound and audio into data first before they are sent, this ensure better quality and its also more secure. Having multiple receivers can be useful as it means one can be left in the room and another can accompany you as you move around the house. If you have more than one child then these can be a great help as you can use them to monitor two or sometimes even three rooms and check all you children as they sleep. Alternatively they can be used to monitor your children’s play area or can be set up at different angles around the room giving you a better view of your child as they slumber. This is not just clarity of sound but also of video. With better sound and video image quality you can see and hear what’s going on. While it’s not essential to hear everything in your baby’s room it is nice and very reassuring to have clear audio and video images. Sometimes you can use two transmitters in the same room to help with this. Sound Activation and Motion Detection. You will find many monitors will have a sound activation and will cut out any background hiss and static only actively transmitting when they detect a noise. These monitors may also include a sound activation indicator so even if your vacuuming, watching TV or listening to music you can see at a glance if there is any cause for concern. Others even use motion detection to draw your attention which can be useful for monitoring restless sleepers or slightly older children hat climb out of their crib in the night. It’s hard to see in the darkness and for that reason many cameras have night vision. This allows for clear images even at night so you can see your little ones clearly without disturbing them or turning on the lights. Always check the battery life and what batteries if any a monitor will take. Most receivers are rechargeable and have batteries that offer several hours of usage. Typically this is not of great concern when buying a baby monitor but if you getting one with a portable receiver it’s worth noting. One of the last things to consider is price, this will obviously play a role in your choice of baby monitors. This post was written by Chinavasion. The company tries to offer great value to their customers and offer great wholesale prices for a range of baby video monitors. They all come with a 12 month warranty and with express mailing. Learn more at www.chinavasion.com.